New Year's invites predictions. New Year's at the start of a decade seems to beg for them. Looking back at past predictions is a helpful way to keep all the current prognosticating in perspective. One cautionary example: a forecast for the coming decade in aviation published 100 years ago. It appeared in the January 2, 1909, edition of the New York Times -- in the "Automobile" section -- under the headline, "Limit of Flight Not Yet Reached." The author was Cortlandt Field Bishop, an early aviator and president of the Aero Club of America. Bishop wrote about the "astonishing development of aeronautics" in the half-dozen years since the Wright Brothers historic flight in North Carolina. "That the advancement of human flight has exceeded the most sanguine expectations of the boldest and most enthusiastic follower of the sport must be admitted, and it would seem the wildest prediction as to the future may not be classed as impossible," he said. "From an experimental standpoint aviation has graduated into actuality. It is a lasting tribute to the inventive genius and ingenuity of man, but the question of adaptability to commercial purposes and practical uses is yet far removed. The practical heavier-than-air machine is not here, and it is doubtful whether this decade will ever see it." Early aviators had pulled off headline-grabbing feats in the final months of 1909. Wilbur Wright himself had soared over New York City and even circled the Statue of Liberty during a series of demonstrations that fall. Two weeks later, Count Charles de Lambert made an unannounced half-hour flight high above Paris, circling the Eiffel Tower in yet another Wright-made aircraft. But the capabilities, range and safety of those early airplanes were still extremely limited. Focusing on those realities, Bishop cautioned that the new flying machines would be of "doubtful value in warfare," except perhaps for certain surveillance missions. Any "suggestion of equipping heavier-than-air machines with small guns" was simply impractical, he wrote, and "the use of aeroplanes at night for warfare purposes is entirely out of the question." The Aero Club president also reminded readers that using aircraft to transport "cargo of any weight" was "impossible" at that point -- "but progress is being made rapidly and a revolution of the science may accomplish wonders." 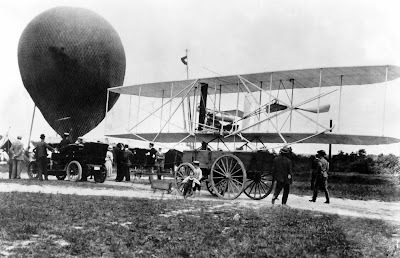 "For some considerable time the practicability of the heavier-than-air machine will be confined to record-breaking flights and gradual improvements in construction, and it will be a pleasant recreation for the owner of an aeroplane to jump into his machine and make a short call on a friend at a distance of from ten to 100 miles and return, but while many changes in mechanical flights will be accomplished in the next decade, the social life will not be disturbed and conditions will exist similar to those of the present day." So how did our prognosticator do? Well, by 1911, a year after Bishop's article appeared in the Times, the first air mail routes were sprouting in various places around the world. Within a few years aircraft were conducting military reconnaissance and bombing missions over Europe. Aerial combat quickly followed -- changing warfare forever. The aeroplane's far-off future arrived ahead of schedule. But Bishop had no reason to be ashamed of his forecast. After all, no less an aviation authority than Wilbur Wright had once famously told his brother "that man would not fly for fifty years." That was 1901 -- just two years before their breakthrough at Kitty Hawk. "Ever since," Wright said, "I have distrusted myself and avoided all predictions."